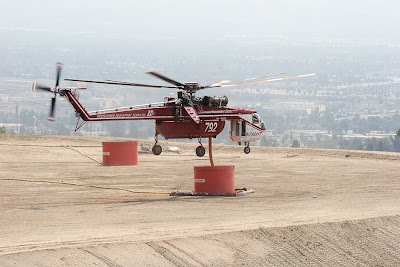 The helipad had been set up as a refilling area for the helicopters fighting the Station fire. I saw a report saying that the temperature has fallen in the last day which is good news for all the fire fighters. Nice shot of the helicopter. Steffe: The humidity is up , which helps fight the fire, but the temperature still gets over 100 degrees. I don't know how the firefighters do it. Altadenahiker: It was quick and they made it look easy. Impressive. Great action shot, but what a pity that it has to be happening.